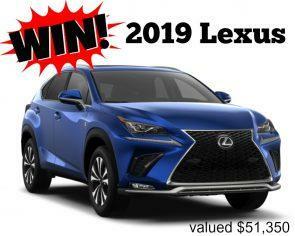 Prize: (1) 2019 Lexus NX 300 F Sport Series 1 with an approximate retail value of $51,350.00 CAD. Prize includes destination/freight charges and all applicable fees and taxes. Statistics: This contest was opened by 1753 and entered by 328 ContestChest.com members. 19% of those who opened the contest, entered it.